The present study was carried out to assess the changes in some of the in vitro parameters of PC stored for 10 days with and without PAS. Random donor platelets with prolonged and improved shelf life will help to meet logistics support of increased platelet availability for clinical transfusions. The present study was conducted on samples of forty two blood donors, both male and female donors. These donors were selected after a complete medical history and examination. Platelet donors having negative screening test for transfusion transmitted infections such as malaria, hepatitis B virus (HBV), hepatitis C virus (HCV), human immunodeficiency virus (HIV) and syphilis were included in the study. All the PC were obtained from the whole blood by routine phlebotomy into 450 mL bags containing 63 mL of citrate phosphate dextrose A1 anticoagulant in triplet bags (JMS PTE Ltd, Singapore). All of these PC were kept in a platelet incubator (HELMER Company, China) at 22°C and were constantly agitated for 10 days. A volume of 3 ml of sample was taken from both groups on day 0, 3, 5, 7, 8, 9 and 10 to record study parameters of total platelet count, MPV and Swirling. The platelet count and MPV were evaluated by automated cell counter (SYSMEX KX-21, Sysmex Corporation Kobe, Japan). Platelet swirling was observed by using 50-100 watt white light source. The results of platelet swirling test were scored as score 0-3. For microbiological cultures additional 5 mL sample was taken to observe bacterial contamination of PC. Aerobic culture was performed on all the samples on the day on day 0, 5 and 10 using fully automated culture system, BACTEC (BACTEC System 9240, Beton Dicknson and Company, United States). The data was entered and analyzed using PASW 18.0 (formerly known as SPSS) (Predictive Analytics Software). Continuous data was expressed as mean ± standard deviation and categorical data was expressed in frequencies and percentages. The independent-t-test was applied to compare the PC in both groups on day 0, 3, 5, 7, 8, 9 and 10. Analysis of variance (ANOVA) for repeated measures was also used to analyze the data. P ≤ 0.05 was considered to be statistically significant. The results showed that the mean platelet count in random donor PC stored without PAS was 5.6 ± 0.1 × 10 10 /L on day 0 which decreased noticeably to 3.3 ± 0.7 × 10 10 /L by day 10. 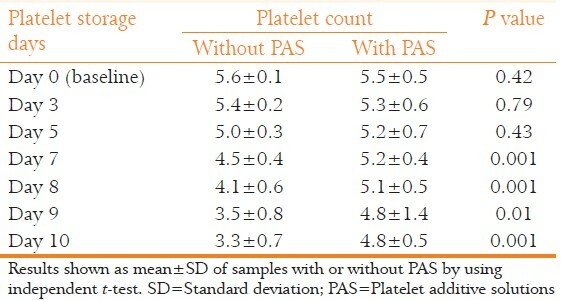 Whereas the mean platelet count in PC stored with PAS was 5.5 ± 0.5 × 10 10 /L on day 0 and was only reduced to 4.8 ± 0.5 10 10 /L by day 10 [Table 2]. The difference between two groups was highly significant (0.001). This difference was also observed with repeated measures using ANOVA as shown in the [Figure 1]. MPV in random donor PC stored without PAS was 8.0 ± 0.1 fL on day 0 and was found to increase considerably to 13.0 ± 0.4 fL on day 10. On the other hand, the MPV in PC stored with PAS was maintained during 10 days storage with statistically significant difference of 0.001 between two groups [Table 3]. 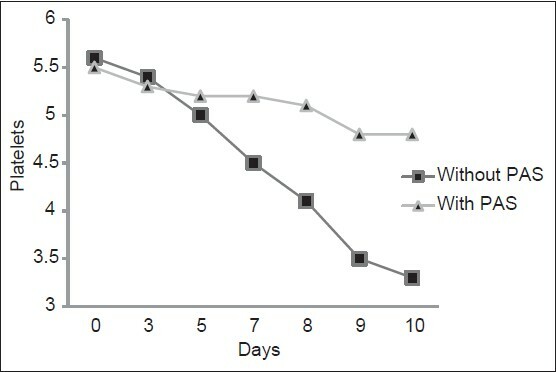 This difference was also appreciated by using ANOVA as shown in the [Figure 2]. 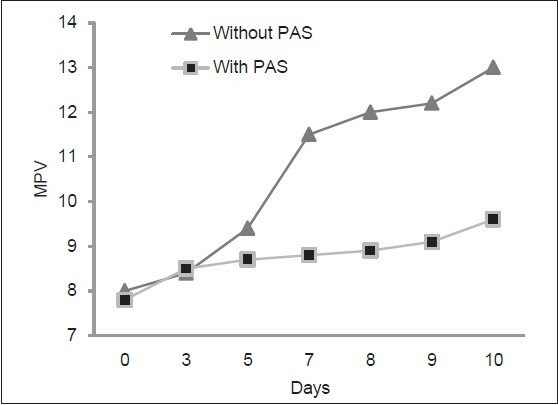 The swirling results showed that it was better observed during 10 days storage in PC with PAS when compared to PC without PAS [Table 4]. Platelet discoid shape correlates with in vivo viability after transfusion. Stored PC can be monitored for the loss of discoid shape before they are transfused and for this swirling is a reliable method of quality control as it correlates with platelet function. Consumption of glucose causes reduction of pH leading to swelling of platelets. The PC slowly become turbid showing decreased swirling. Our results of swirling were scored and it was observed that the swirling score was much better in all the PC stored in PAS as compared to plasma. Similar results were also reported by two other groups. Blackwell Publishing Ltd.
We conclude from our study results that platelet morphology and other parameters were better maintained in PC stored in PAS. 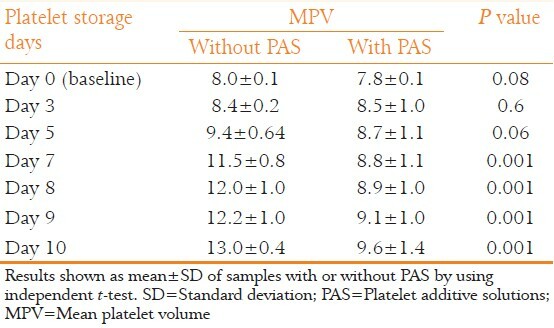 Significantly less decrease in platelet counts and comparatively slight increase in MPV were observed in PC stored with PAS when compared to PC without PAS. 1. Brass LS, Gelil GT, Zhu L, Woulfe DS. Signal transduction during platelet plug formation. Platelets. 2 nd ed. Amsterdam: Academic Press/Elsevier Science; 2007. p. 319-39. 2. Liumbruno G, Bennardello F, Lattanzio A, Piccoli P, Rossetti G, Italian Society of Transfusion Medicine and Immunohaematology (SIMTI) Work Group. Recommendations for the transfusion of plasma and platelets. Blood Transfus 2009;7:132-50. 3. Gupta A, Chandra T, Kumar A. Evaluation of random donor platelets at different temperatures for an ex-tended shelf life. Biomed Res 2010;21:433-6. 4. Borzini P, Lazzaro A, Mazzucco L. Evaluation of the hemostatic function of stored platelet concentrates using the platelet function analyzer (PFA-100). Haematologica 1999;84:1104-9. 5. Devine DV, Serrano K. The platelet storage lesion. Clin Lab Med 2010;30:475-87. 6. van der Meer PF, Pietersz RN, Reesink HW. Storage of platelets in additive solution for up to 12 days with maintenance of good in-vitro quality. Transfusion 2004;44:1204-11. 7. Singh H, Chaudhary R, Ray V. Evaluation of platelet storage lesions in platelet concentrates stored for seven days. Indian J Med Res 2003;118:243-6. 8. Hegazai M, Qari M. The influence of exposure to light and dark environment on platelets concentrates during storage. Alexendria Bull Fac Med 2007;43:709-16. 9. Mathai J, Resmi KR, Sulochana PV, Sathyabhama S, Baby Saritha G, Krishnan LK. Suitability of measurement of swirling as a marker of platelet shape change in concentrates stored for transfusion. Platelets 2006;17:393-6. 10. Bertolini F, Murphy S, Rebulla P, Sirchia G. Role of acetate during platelet storage in a synthetic medium. Transfusion 1992;32:152-6. 11. Gulliksson H. Platelet additive solutions: Current status. Immunohematology 2007;23:14-9. 12. Sweeney J, Kouttab N, Holme S, Kurtis J, Cheves T, Nelson E. Storage of platelet-rich plasma-derived platelet concentrate pools in plasma and additive solution. Transfusion 2006;46:835-40. 13. Ringwald J, Zimmermann R, Eckstein R. The new generation of platelet additive solution for storage at 22 degrees C: Development and current experience. Transfus Med Rev 2006;20:158-64. 14. de Wildt-Eggen J, Nauta S, Schrijver JG, van Marwijk Kooy M, Bins M, van Prooijen HC. Reactions and platelet increments after transfusion of platelet concentrates in plasma or an additive solution: A prospective, randomized study. Transfusion 2000;40:398-403. 15. Hornsey VS, McColl K, Drummond O, McMillan L, Morrison A, Morrison L, et al. Extended storage of platelets in SSP platelet additive solution. Vox Sang 2006;91:41-6. 16. Hirayama J, Azuma H, Fujihara M, Homma C, Yamamoto S, Ikeda H. Storage of platelets in a novel additive solution (M-sol), which is prepared by mixing solutions approved for clinical use that are not especially for platelet storage. Transfusion 2007;47:960-5. 17. Tynngård N. Preparation, storage and quality control of platelet concentrates. Transfus Apher Sci 2009;41:97-104. 18. Singh RP, Marwaha N, Malhotra P, Dash S. Quality assessment of platelet concentrates prepared by platelet rich plasma-platelet concentrate, buffy coat poor-platelet concentrate (BC-PC) and apheresis-PC methods. Asian J Transfus Sci 2009;3:86-94. 19. Lozano ML, Rivera J, Bermejo E, Corral J, Pérez E, Vicente V. In vitro analysis of platelet concentrates stored in the presence of modulators of 3',5' adenosine monophosphate, and organic anions. Transfus Sci 2000;22:3-11. 20. Gyongossy I, Maria C. Platelet Additive Solutions, Canadian Blood Services, 2008. 21. Chandra T, Gupta A, Kumar A, Afreen S. Morphological and functional changes in random donor stored for seven days in platelets additive solution. Int J Blood Transfus Immunohematology 2011;1:120-5. 22. Slichter JS. Extension of platelet storage: Fact or fantay. Food and Drug Administraton Blood Products Advisory Committee Meeting, Gaitherburg, MD, 2002. 23. Sandgren P, Mayaudon V, Payrat JM, Sjödin A, Gulliksson H. Storage of buffy-coat-derived platelets in additive solutions: In vitro effects on platelets stored in reformulated PAS supplied by a 20% plasma carry-over. Vox Sang 2010;98:415-22. 24. Goodrich RP, Li J, Pieters H, Crookes R, Roodt J, Heyns Adu P. Correlation of in vitro platelet quality measurements with in vivo platelet viability in human subjects. Vox Sang 2006;90:279-85. 25. Vollmer T, Dreier J, Schottstedt V, Bux J, Tapernon K, Sibrowski W, et al. Detection of bacterial contamination in platelet concentrates by a sensitive flow cytometric assay (BactiFlow): A multicentre validation study. Transfus Med 2012;22:262-71. 26. Schrezenmeier H, Walther-Wenke G, Müller TH, Weinauer F, Younis A, Holland-Letz T, et al. Bacterial contamination of platelet concentrates: Results of a prospective multicenter study comparing pooled whole blood-derived platelets and apheresis platelets. Transfusion 2007;47:644-52. 27. Hillyer CD, Josephson CD, Blajchman MA, Vostal JG, Epstein JS, Goodman JL. Bacterial contamination of blood components: Risks, strategies, and regulation: Joint ASH and AABB educational session in transfusion medicine. Hematology Am Soc Hematol Educ Program 2003;1:575-89.